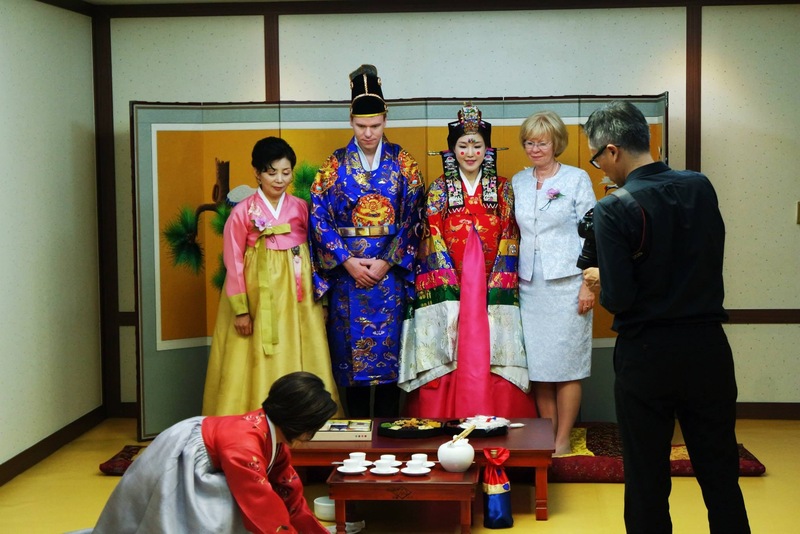 So the main reason that we went to Daegu was that we were invited to take part in a wedding. 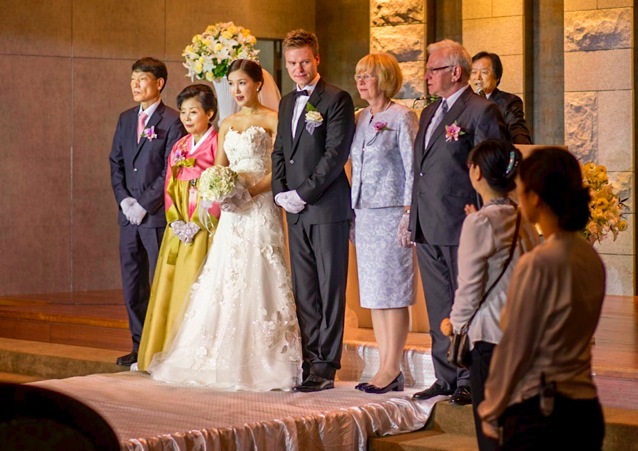 It was a mixed wedding, the groom was Polish and the bride Korean (but they both live in Hong Kong) so we were curious what traditions they would follow. It was a mix – they started off with a typical white wedding dress Western wedding, which took place in two languages. There were about 300 guests, but only about 40 Westerners – all the others were Korean. 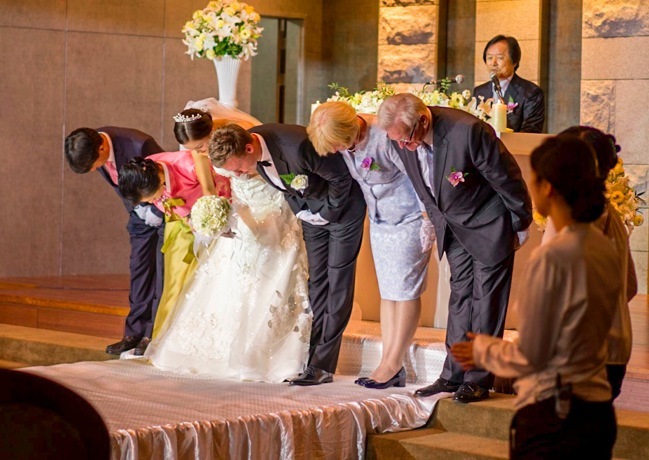 The beginning was like a typical wedding – the father was walking the bride down the aisle. But then there were some different elements – for instance the master of ceremony read out the CVs of the bride and groom, literally listing all the different cities they lived in, jobs they worked in and what they like doing. Then there were so many different bows – not just bows by the wedding couple to each other, but to their families, and the families were bowing back. The fun part was that there was one moment where the groom had to shout three times – some Korean words to mean something positive and good luck, that was very entertaining. Then they had two singers – with pretty good voices! It sounded like a Korean love song, it was quite emotional for the bride. Finally a fake cake was cut and the wedding couple and their parents gave each other a toast… then the formal Western part was over. It was time for the group photo shots. After that, there was a small Korean tea ceremony – this was only for close family. Unfortunately we couldn’t attend, but here are some pictures the bride and groom shared with us. 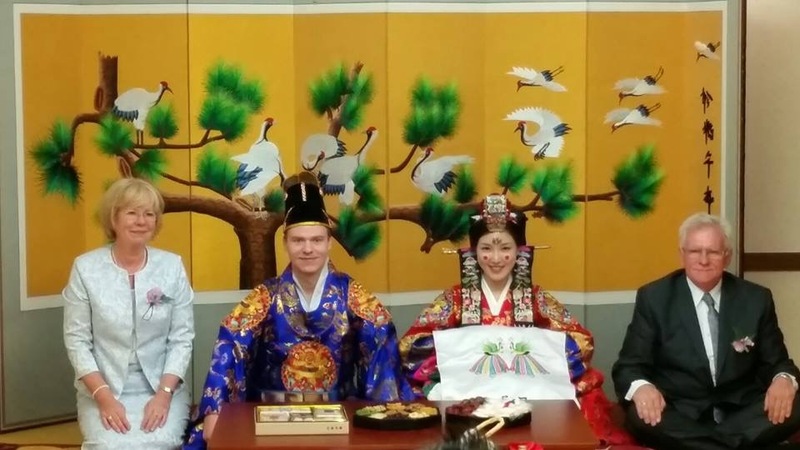 It looked really nice – the bride was wearing the traditional hanbok and the groom had also some interesting traditional wear! Meanwhile, we had a buffet lunch – with wedding guests from a couple of other weddings that took place at the same time in the hotel. This part was a bit strange. 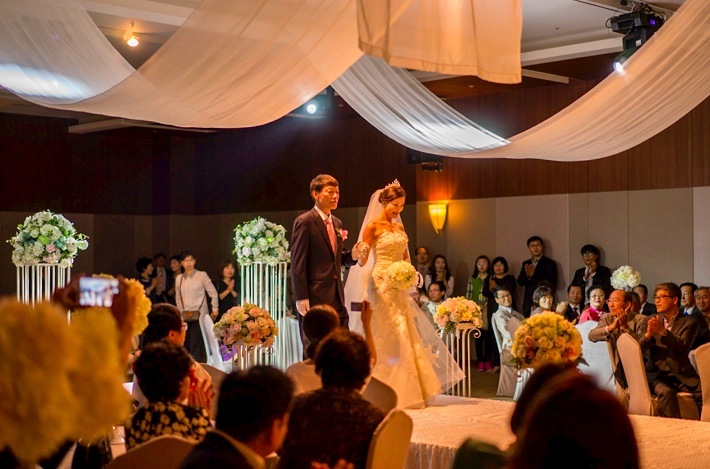 It was even stranger that the Korean wedding guests left after that… the wedding was over for them. Luckily for us, we continued to celebrate the Korean-Polish wedding. We went out for a lovely, cozy dinner for the 40 Western guests and a few close friends of the bride (but not her family, as the official wedding part was over) joined too. The Polish wedding guests sang a proper Polish wedding song, there was lots of wine involved – and we headed off to a bar followed by a club. That was more like a proper wedding, with lots of drinks, laughter and good luck wishes for the married couple! In many Korean weddings, you have people who come for the lunch/dinner and don’t even the ceremony itself. They drop their envelope of cash at the reception (a Korean wedding is a major cash business affair), grab food and leave. Wow, how unique to be part of that wedding! Very interesting. It’s always cool to experience other cultures and rituals, don’t you think?